Convenience-wise, frozen vegetables are a godsend on busy nights but taste-wise, you don't expect much. This Trader Joe's packet is an exception. 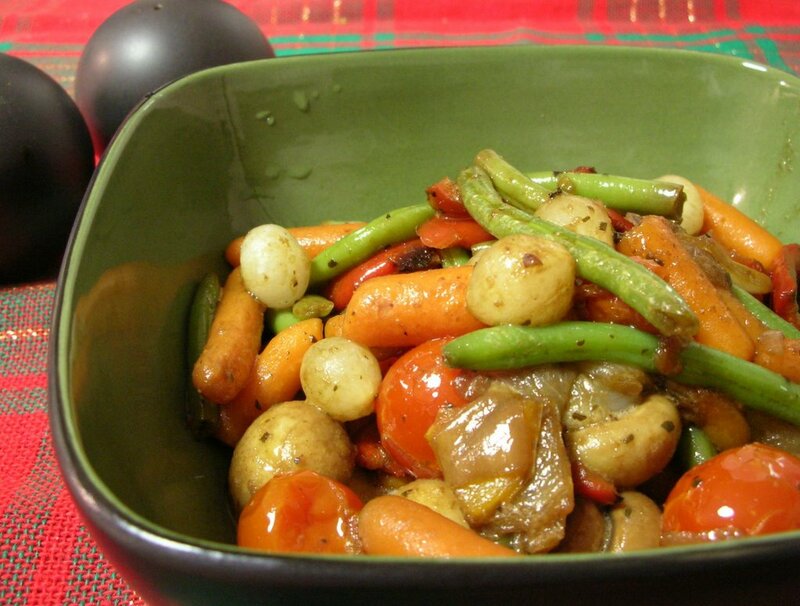 Officially it's called "Fire Roasted Vegetables with Balsamic Butter Sauce". It heats up in just a couple of minutes and yields great-tasting vegetables and a delicious buttery-balsamic sauce. The packet includes a pound of vegetables, which Trader Joe's says serves 6 and which A Veggie Venture normally would normally say serves 4. Six servings works in that restaurant-a-few-veggies-on-the-side-manner if the entree is substantial and there's another vegetable or salad. Four servings? Maybe. It just didn't seem to go that far. The directions say to add a tablespoon of oil -- there's tons of buttery sauce without, next time I won't add a drop. There is a lot of sauce -- maybe a half cup? -- so think about rice or pasta to soak it up. I'd definitely throw a bag or two into beef stew or fresh pasta. For other product reviews and quick-quick ideas, see 100% Convenience in the Recipe Box. Prepare according to instructions except omitting the oil. I love Trader Joes! I wishwishwish we had one in Vancouver, BC!! Those look so tasty! I don't think we'll ever get Trader Joe's in Utah either. Sigh. Live in hope, you two. My hometown of 1000 people just got a McDonald's. Still waiting on a stoplight. Hi everyone, Traders now have fire roasted asparagus, a southwest blend and fire roasted roma tomatoes. All these products on have a spit of olive oil and a touch of salt and pepper and that it!!! another good trick with these veggies is to pick out some of the sauce discs. they're little frozen nuggets of sauce, and i take out some because i find the veggies to be too soggy with all of the included. they taste like they should have way more WW points than they do! This might sound wacky but I just heated this in the microwave along with a Smart Ones angel hair pasta and its completely delicious and filling... and a lot of sodium. I split the finished mix in thirds, making three meals at 227 very filling calories, 12 grams fat (darn butter sauce). Didn't add oil. I found your blog because I was looking for nutrition info. Nice blog!! The "Fire Roasted Vegetables" are my favorite trader joe's veggie side item. And yes, it's excellent over rice. We typically do plain brown rice which is incredibly bland by itself, but mixed in with this vegetable mix and some diced chicken makes an excellent meal, and it re-heats great too.